Transcend’s high capacity, high performance microSDHC Class 6 memory cards are fully compatible with SD version 2.0 and comply to Class 6 speed standards, offering guaranteed write speeds of at least 6MB/s to ensure your device remains quick and responsive while saving, copying, recording or viewing files. Its extra-large storage capacity allows you to use your portable device more effectively, with the added convenience of being able to store hundreds more music files, video clips, pictures, games and personal information. 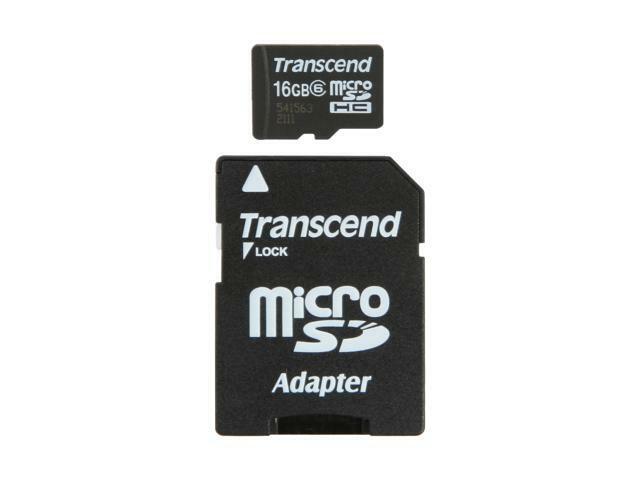 Transcend’s micro SDHC Class 6 memory cards are the perfect compliment to your cell phone, game console, GPS, or other portable device. microSDHC Card At 10% the size of the standard SD card, the Transcend microSDHC card offers generous storage capacity to meet the growing needs for storing more media contents on your mobile devices. ECC and ISP Each card contains built-in Error Correcting Code (ECC) to detect and correct transfer errors during data transfer, and allows In System Programming (ISP) for updating firmware. Mechanical write-protection switch Mechanical write-protection switch on the included adapter prevents the content from being erased or overwritten by accident. Cons: I called ahead regarding their lifetime warranty. I was even warned they are quick to call it abuse and not honor their warranty. It was flawless never abused. I was unable to write to the card in my phone then tested it with my laptop. Other Thoughts: Get a brand that stands behind their product! I've never written a negative review before and it is only about $10, hardly worth the time to send it in. I believe thats what they are counting on. What a waist of my time. Cons: Started losing data right after the 30-day return policy expired. Other Thoughts: Worked as advertised for the first 30 days or so, then started losing data. Comments: After owning this product for over a month now i must say is does what it says and doesn't fail. Use this on my Samsung galaxy sII 727 and flashes my roms within mins. Comments: Will try for an RMA, we'll see what happens. Other Thoughts: This card is pretty much unusable with my droid x. It causes freezes, data issues, and all of this can be random. I didn't get a bad card and most people don't btw, but I've tried this on two droid x's, same results. For the quality and price I give it 3 stars, one down for price and one down for cheap plastic used and lack of usb adaptor.